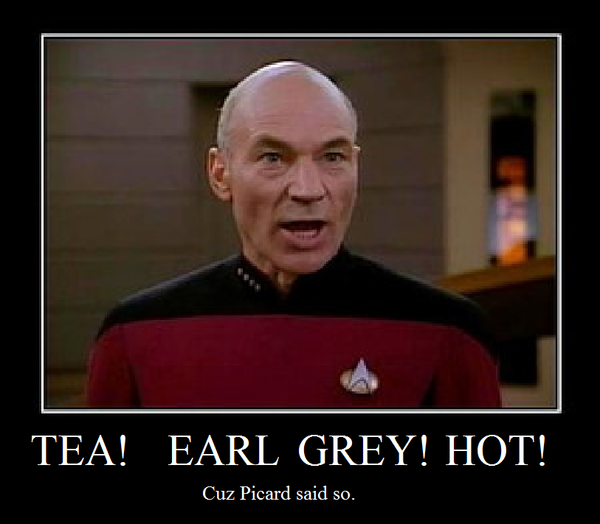 This entry was posted in Basics & FYI, Drinks and tagged diet, drinks, earl grey, Picard, tea, zero calorie by Nejotak. Bookmark the permalink. Mmmm… tea…. One of the best 0 calorie parts of my day. Unless it’s a soy chai latte, which is 190 calories of yum. My obsession with tea started in ninth grade, until my love affair with mochas my junior year. There will always be tea boxes in my cupboard and freshly brewed ice tea in my fridge. Love that you guys had so many varieties at one time! I love chai so much. It’s bad, the Starbucks staff just asks “Short or Tall?” when I go in there each afternoon. Tall if it’s a bad day/bad week, short if it’s not. I wish they had other non-dairy milk there, like almond milk. We tried frothing rice milk at home with no luck but the almond milk works wonderful and the taste complements the spicy chai, too. Almond milk is tasty. I’ll have to try using that instead of soy at home. It never froths up the way I like it. I miss milk. Love that they know you so well at Starbucks 🙂 It always cheers me up, too. My outings tend to consist solely of Target shopping with a chai latte. So good. I, also, used to hate tea. Then, I worked at Starbucks where I was forced to at least try every drink we served. That is when I realized I *did* like tea! It’s wonderful when I’m sick… I’ve even learned to like it with some honey in it to help the throat. Ooh, I used the Stash Double Chai for a Vanilla Chai cupcake recipe a couple months ago. I haven’t tried it as tea, though. Will have to! ❤ Starbucks.